We are live! What’s new? Appointment mode – This works like hotel, concert or doctor’s appointment bookings: firstly, it allows respondents (‘invitees’) to choose only ONE date or time slot, and secondly once such a slot is chosen, that chosen slot is then disabled for other respondents, thus preventing double-bookings. Export responses to Excel, CSV or ICS – You can now export your meeting responses to excel, CSV or ICS formats. This will enable you to import dates into your own calendar, or to sort your respondents in a way that best suits your requirements; some of users use MeetOMatic to schedule events with hundreds of participants, so exporting to Excel will make managing a large volume of responses a piece of cake! Super-User Admin – We now have multi-user accounts – great for businesses who want a meeting scheduler that doesn’t cost the earth and allows all of their employees to schedule their meetings in the simplest way possible! New Pricing – MeetOMatic is the cheapest meeting scheduler out there. We also offer the most features per $. Go ahead, check out our rivals and see if you fancy paying 66%* more for similar features, not to mention scheduling which takes longer and has a more klutzy UI (We know, we timed it. 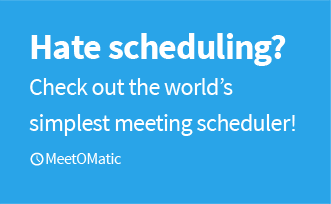 It typically takes 30 sec – 1 min less time to schedule a meeting using MeetOMatic. Time is money, afterall). We are of course still retaining the free version for basic scheduling needs! Those are the main changes that you’ll notice as a customer (along with the new look, which brings the site a bit more up to date). We made some backend changes also to enable us to offer a better and more reliable service. Want to get these awesome features? Sign up for MeetOMatic Pro today! *Price comparison between MeetOMatic and 12 other leading schedulers, undertaken Dec ’14. On average we are 40% cheaper than the competitors.